Ordering my third. We used the first for several years before we broke it (totally our fault) and are still using the second (going on second or third year now). This third one is for our lake house. Love not having plastic! We bought this to reduce the amount of plastic wrap we were using (and microwaving). Today my husband dropped it when transferring something covered to the fridge (marinating chicken) and broke it so we are getting a new one. I will say I have dropped it before but it never cracked, and we've had it for two years. It is glass so I expected it to break with a certain amount of misuse and was surprised it didn't break sooner. We really like the functionality, cleans up easily and stores on top the microwave. Love the idea of it but bumped on the microwave and broke in lots of pieces. Ugh... it was a light bump. Bought it in September and it broke in November. I was thrilled to find this as a replacement to the plastic cover we were using. We are very careful with it and my husband and are the only ones who use it (i.e., not the kids). However, we were very disappointed to see that without any known dropping or bumping it, it cracked to where it can no longer be used. We have had it for about 1 year and a 1/2. I think it should last longer than that. 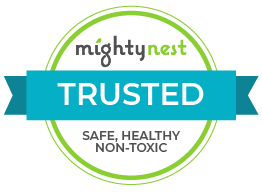 Mighty Nest doesn't guarantee it after 90 days. That is disappointing and now we need to decide if we should buy another one or try to find something else. I purchased the microwave cover at the end of October. Today (end of January), there is a chip out of the edge and a crack beginning to go up the side. I was very excited to find this product but it definitely did not live up to my expectations.